V-M Orthotics Ltd joined our Woundcare-Circle partners at this year’s Wounds UK event in Harrogate (5-7th November) to promote leading DARCO, Heelift and Optima Molliter range products in the fight against pressure ulcers. 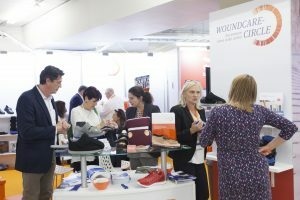 Many of the healthcare professionals visiting the stand commented how refreshing it was to see that three companies were pooling and showcasing their products under one algorithm banner in order to prevent or help treat pressure ulcers, and that this represented a shift in seeing individual companies promoting their own products. This year’s theme was of great importance to everyone; “Integrated strategies and solutions for quality outcomes”. 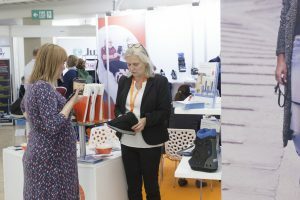 The sessions provided the most up-to-date information on the current findings with regard to clinical assessments, research and policy shifts from around the UK. Founding member of Woundcare-Circle, DARCO, focuses on bringing the latest innovations and information to the forefront. The common algorithm supports effective risk assessment and management for the care of the Diabetic foot. The discussions were in-depth and fruitful as we met face-to-face with healthcare professionals sharing a mutual goal; to improve the lives of those suffering from afflictions to the foot. 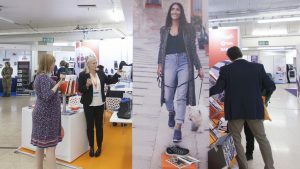 As every year, the event brings a unique group of professionals together and without question this year was no exception. We were in excellent company with the neighbouring organisations and felt a strong coalition with mutual respect and admiration. Legs Matter Campaign, supported by NHS England is a non-profit organisation working to elevate awareness and increase understanding on lower leg and foot conditions among the public and healthcare professionals. Next year’s event is indeed in the calendar and we hope to see you there!